As you can see in this video I have managed to use PMVS2 with PhotoSynth output. PMVS2 for windows is a 32bit applications, so it has a 2Gb memory limits (3Gb if you start windows with the /3Gb options + compile the app with custom flag ?). I haven’t tried yet the 64bit linux version but I have managed to compile a 64bit version of PMVS2. My 64bit version manage to use more than 4Gb of memory for picture loading, but it crashes right after the end of all picture loading. I didn’t investigate that much, it should be my fault too, compiling the dependencies (gsl, pthread, jpeg) wasn’t an easy task. Anyway, PMVS2 should be used with CMVS but I’m not sure that I can extract enough information from PhotoSynth. Indeed Bundler output is more verbose, you have 2d/3d correspondence + number of matches per images. I think that I can create a vis.dat file using some information stored in the JSON file but it should only speed-up the process, so it doesn’t help that much with the 2Gb limits. I have released a ToolKit for PhotoSynth that permit to create a dense point cloud using PMVS2. 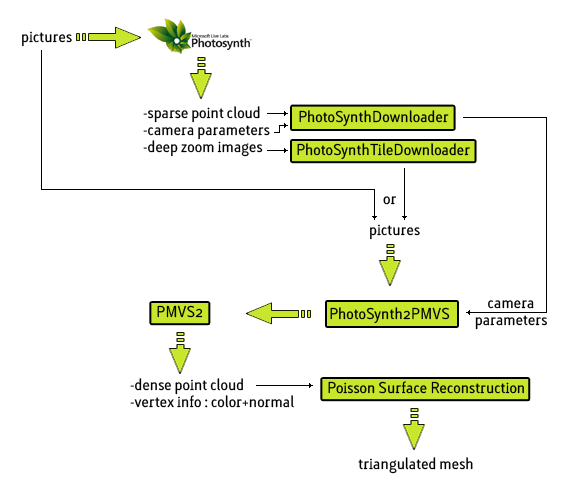 You can download PhotoSynthToolKit1.zip and take a look at the code on my google code. I’ll give more information about it in a few day, stay tuned ! Edit: I have removed the worflow graph and moved it on my next post.